It’s harder for Western students to grasp a concept that’s inherent in the Chinese psyche and its culture. At times it seems impossible, as Western students try to interpret the concept on the basis of their own beliefs and interpretations. In approach and practice, Chinese students do, while Western students question. Chinese students go by feeling and sensing movement, while Western students are concerned with the mechanics, or kinetics, of movement. Speaking as a Western CMA student, I’ve noted some cultural differences between myself and my teacher’s generation that could account for the observations made by Chen ZiQiang. However, I do not think these cultural differences are on the level of interpreting technical concepts within the martial art, but rather play a role in determining the kinds of people, Western and Chinese, who are drawn to CMA, and their different motives and perspectives in learning the art. The most obvious distinction between Western and Chinese cultural experience of CMA is that for Westerners CMA is a foreign entity, a discipline routinely depicted in Western media and culture as mysterious, exotic, and esoteric. In introducing and reintroducing Asian martial arts generally to the West, the media has typically sought to distinguish Asian martial arts from Western martial arts such as boxing and wrestling. The cultural context that depicts boxing and wrestling as relatively straightforward and intelligible physical endeavours seizes upon Japanese and Chinese martial arts as somehow being “more than” their Western counterparts. Western audiences have been assisted in this interpretation by various spiritual and esoteric aspects of Asian martial arts, not to mention the mythic oral histories, performance-oriented demonstrations of skill and strength, and the absence of the kind of regulatory or competitive platform found in Western sports-oriented martial arts. In other words, some degree of esotericism is built into Asian martial arts, yet this esotericism has in turn been exaggerated and made the raison d’etre of Asian martial arts for generations of Western audiences, and some proportion of Western students. This is, I think, the first cultural difference between Chinese and Western students of CMA, and I have to admit it is prominent in my own relationship with the art I’ve practiced for more than half my life. Why is it that I, and others like me, are so drawn to CMA but have no interest in Western boxing, or indeed in sports generally? For us boxing and sports feel like a known quantity, a domain where little counts beyond sheer physical skill. The domain of CMA is immediately appealing because it seems to promise at face value a blending of physical skill with other kinds of skills albeit ones that are only dimly perceived. The whole point of many demonstrations of skill in CMA is to show that there is something ‘unusual’ going on, that the demonstrator has strength or speed or power that somehow goes beyond what we would expect from a purely physical skill. We expect a boxer to be able to hit hard, or a wrestler to be able to throw or pin people with ease. But CMA demonstrations typically hinge on a disparity between skill and appearance: the teacher who hits much harder than expected and with little apparent effort; the senior student who seems impossible to push or pull or otherwise move; the grandmaster who is able to move you around with ease, with a strength that is incommensurate with his apparent frailty. None of these demonstrations are ‘obvious’ in their mechanics or physical logic, and they present a puzzle and then a goal that becomes irresistible for many Western students. Western students generally are drawn in and motivated by achieving these same skills or abilities for themselves, but such skills and abilities typically remain incomprehensible despite years of training. The problem is twofold: firstly, the disparity between the ‘normal’ rigours of martial arts training that develops comprehensible physical skills, and the esoteric and intriguing skill-set of the teacher that remain beyond our understanding and our reach. It is not at all apparent how ordinary training can produce extraordinary results, and many students remain stuck, grappling with this apparent paradox. For many students the disparity between training and the desired skill-set leaves them preoccupied with a goal they do not understand and do not know how to achieve. Assuming that the teacher is able and willing to actually teach these more advanced skills, they may nevertheless find that their students are so entranced by the idea of unusual power or superhuman skill that they fail to appreciate, understand, or properly commit to the more prosaic skills and fundamental physicality of basic training. The irony is that such students would develop much better skills if they focused on learning the art as though it had no esoteric or mysterious connotations whatsoever. The second and perhaps more challenging aspect of this cultural problem is that a subset of these entranced Western students are the kinds of people who have no real interest in or affinity for sports and physical disciplines in the first place. The esoteric appeal of CMA and the demonstration of skills that seem to depend on something other than sheer physical strength attract people who are implicitly poorly equipped to learn a martial art in the first place. For me this part of the problem is personal: why is it that I have no interest in boxing, yet an overwhelming and enduring interest in CMA? Because CMA somehow promises more than boxing does. From an early age, CMA seemed to draw upon more than raw physical talent, and so for someone quite lacking in raw physical talent CMA is an attractive proposition. But the reality is that CMA is intensely physical, at least as much and perhaps more than boxing trained at the same level. The esotericism is a physical esotericism, built on hard training, strength, flexibility, and other fundamental physical attributes that can be developed, yet come more naturally to some of us than to others. Returning to the original point, I suspect that for people raised in a Chinese culture, the esotericism and mysterious skills of CMA are less salient than the physical discipline required. It’s not that Chinese people generally are better suited to CMA, or that their psyches are somehow more attuned to CMA principles, but rather that those who – like me – are naturally unsuited to physical disciplines and lacking in raw talent are much less likely to be entranced and attracted by CMA. CMA to a person raised in a Chinese culture is more like boxing to a Westerner. The analogy is not perfect, but cultural familiarity strips away much of the esoteric appeal that draws in Westerners like me. In other words, the Chinese version of me doesn’t do kung fu, and through self-selection, teachers like Chen ZiQiang will encounter more over-analytical, questioning, missing-the-point Western students than they will Chinese. The irony is that magnifying the impression of esoteric or mysterious skills prevents us from truly developing any significant skill. The answers could be right in front of us, yet the sense of ‘something more’ prohibits us from recognising the real nature of the skills exhibited by our teachers. Having trained a martial art for more than half my life with fundamentally the wrong attitude, I should probably be relieved to have nonetheless made some progress, rather than being disheartened by my lack of progress. Perhaps a better attitude for people like me is to recognise from the outset that CMA is not a physically less demanding discipline, but a more demanding one; that whatever physical problems or lack of talent we face will not be compensated for by something esoteric within CMA; that ‘understanding’ CMA without doing the physical work will be as fruitless as ‘understanding’ boxing, weight lifting, or jogging without doing the physical work. What I really need to understand is not how my teacher ‘mysteriously’ has so much power, but why I mysteriously have so little. My goal should not be to discover the esoteric logic at the heights of CMA, but to work out the overlooked question of why I have failed to fully embrace the most basic physical form and discipline. I need to start looking at CMA not as a way to compensate for physical impediments, but as a context in which to challenge, identify, and remedy them. Melancholics are idealists, and in any venture or activity we seek out and adhere to the ideal. This can be both an advantage and an obstacle. For example, I mentioned in a previous post that I always thought the ideal approach to exercise would be to incorporate it into everyday life, avoiding ‘exercise for its own sake’. What I neglected in this approach is that such an ideal may not be attainable given the circumstances of a contemporary lifestyle, but also that people do in fact ‘exercise’ for fun and enjoyment. People run, ride, walk and play sports because it is enjoyable. But if you presume at the outset that exercise is onerous and pointless exercise is adding insult to injury, then this insight will evade you. Growing up with numerous vague and confounding frailties of posture, coordination, physical tension, fatigue and other interrelated yet undiscovered obstacles may have contributed to this blind-spot toward exercise. On my better days it is obvious that exercise is enjoyable. But most days merely remaining upright is enough of an effort to make exercise seem implausibly demanding. Nonetheless, since I started jogging regularly I’ve noticed a number of minor improvements, but more pertinent to this post, I found myself once again inclining toward the ideal – idealising the difficulty and purity of running or jogging as a simple and complete form of exercise. What this shows is that ideals can be mistaken, ideals can be incomplete, but ideals can also be useful. Perhaps it is best to consider ideals in this context: not so much as eternal and objective truths to be discovered but as a way of seeing the world, a way of understanding, communicating, teaching, and learning. For example, I’ve been learning a particular martial art for about 16 years now, and for nearly half that time I was preoccupied – perhaps ‘obsessed’ is a better word – with finding a definitive copy of the names of the various moves in Chinese. My teacher’s generation were more focused on actually learning the art, and admittedly it seems a bit strange to feel that the name of a movement is in any way key to understanding or performing the movement. A fist by any other name will smack you just as hard around the head. It’s only taken eight years for my enthusiasm to dim; hopefully in part as a result of improving at the art itself. But on reflection I can see that what I hoped to find in the names was not so much a better technical understanding of the movements, but a way of idealising them, of getting to their essence and encapsulating them. It’s true that techniques are not definitive; they can be adapted, changed, put to multiple uses. But the mere fact that a technique has a name means that someone saw fit to name it in a particular way and denote from their own perspective what made this technique specific or unique. This passage clearly indicates that for Wang Bi names are not conventionally determined, but are determined depending on the shi [actuality/essence] of things, on which basis he can say that one cannot trade a name for another, since names have to accord with their actualities, and are determined by depending on these actualities, and not according to the fancy of the person. Again, names arise from xing, not the other way around, for “the name arises from how it appears to us” So in effect for Wang Bi the shi is manifested through the xing, and the names are determined according to the xing. Thus names ultimately are dependent on the shi through the xing, and the names are dependent immediately on the xing. Hence he can say that if there is this name, there must be this form (xing), since the form is the source of the name. Names come from somewhere objective, and this somewhere is the form. What this describes is the creative process inherent in naming a thing. We look to the form, the form in turn is a reflection of the actuality or essence of the thing. Hence the name, deemed appropriate to the form yet also being mindful of the essence behind the form, is always in relation with the reality. No one names things arbitrarily, or rather, an arbitrary name is not a true name. Now the designation is said to be subjective because when I designate something, I simply follow a convention and not the objective xing. Compared to naming, it appears that it is up to me (wo) that the designation is what it is; I am not immediately constrained by the objective form in the thing itself, as I would be in naming. After all, in choosing to adopt a conventional designation, I have implicitly chosen to follow convention even if the words fail to name or correspond to the phenomenal xing, if there is one. In the context of martial arts, as someone who can’t speak Cantonese and doesn’t know the name of a technique, I am instead ‘designating’ a technique through the convention that has evolved in our practice. I can say to a newcomer “We call this move ‘jong’ or ‘kwan’,” but I can’t go beyond that to say that these are the techniques’ names or to explain their meaning in the context of a technique’s form (xing) or actuality (shi). Indeed, the designations used in our art are derived from oral repetition and aural impression of the actual names. The designations are far from arbitrary. Nonetheless, to the original point: I realise now that my fascination with names is a function of idealism more generally. To know the name given to a technique by someone grounded in their practice and study is to have an insight into both the form (xing) and essence (shi) of the technique. It is a somewhat idiosyncratic way of making sense of the art, consolidating and encapsulating it, and translating it into the realm of ideas. I can do things without an idealist approach, but idealism is my greatest strength, the way that makes most sense to me. While other temperaments are inspired by different aspects of life, the melancholic thrives in a world populated by ideals, and a life lived through them. 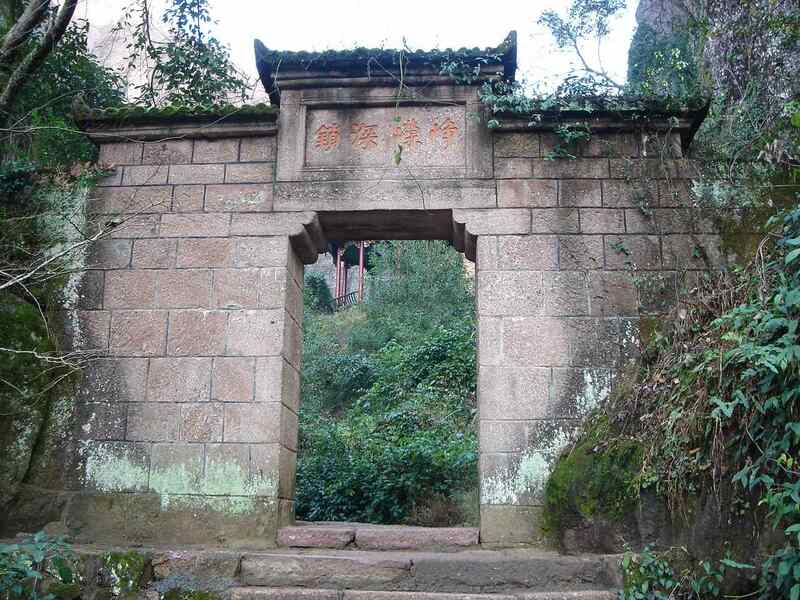 I took this photo about ten years ago at WuYi Shan in Fujian. To me, Kung Fu is kinda like this gate: very old, well-worn, but beautiful, and always promising more on the other side. My kung fu teacher has always emphasised the dangers of fighting, regardless of one’s skill or confidence in a martial art. Last week he put it more succinctly, noting that the greater our ability and knowledge, the greater our awareness of the danger implicit in any physical confrontation. Paradoxically, the better we are at kung fu or any martial art, the less likely we are to use it. When you go on the Way, it makes other people unable to wound you no matter how boldly they stab, unable to hit you no matter how skillfully they strike. Indeed, to be immune to stabbing and striking is still an embarrassment; it is not as good as causing people not to dare to stab you no matter how bold they are, not to dare to strike you no matter how clever they are. Now not daring does not mean there is no such intention, so it is even better to cause people not to have the intent. Those who have no such intention do not have a mind that loves to help or harm. That is not as good as causing all the men and women in the world to joyfully wish to love and help you. If you can do that, then you are a sovereign even if you have no land, you are a chief even if you have no office; everyone will wish for your security and welfare. It’s an amusing quotation, a kind of reductio ad absurdum, but well worth considering in the context of martial arts, and learning to skilfully attack and defend oneself. Skill in attacking and defending are a part of ‘the Way’ even if we never have to use them. There’s a difference, after all, between a person who has a skill but doesn’t use it, and one who doesn’t have the skill and hopes he never needs it. Likewise, there’s a difference between the kinds of people who get in a lot of fights, and the kinds of people who devote years of their lives to learning a martial art. Certainly the former are more dangerous than the latter, but mostly in the same way that a drunk-driver is more dangerous than a skilled driver. These days it is considered vital for martial arts to be ‘reality-based’ or tested somehow in a sporting context or a military or law-enforcement context. But for most of us the reality has nothing to do with these contexts, and even the ‘reality’ of the most common assault scenarios is relative. A few years ago I came across a map of Adelaide that showed the crime rate for specific crimes by suburb. Want to avoid violent assault? The best approach appears to be: a) don’t live in the lower socio-economic areas of the extreme Northern and Southern suburbs, and b) don’t hang around drunk or on drugs in city night-spots in the early hours of the morning. I don’t know a great deal about the historical context in which the Chinese martial art I learn was first created, but chances are it is still more ‘reality-based’ than the behaviour of the drug and alcohol inspired perpetrators of casual violence in our society. In a city with an excellent state-subsidised medical system and a responsive network of paramedics you don’t really need to worry that starting a drunken fight might get you killed, or worse still, leave you injured, disfigured, and unable to work with a string of dependents beggared and homeless thanks to your irresponsible behaviour. I think what attracts many of us to martial arts is that they promise something beyond a mere set of skills driven by utility. They may have started out as that, once upon a time, but in the present era they take on a life and a purpose of their own, bringing a great deal of richness to our own lives even if we are never in a position where the art is ‘useful’ in the most practical sense of self-defence. For me, my martial art encompasses self-defence but goes beyond it, with enough physical, cultural, technical and psychological benefits and fascinations to keep me at it, hopefully until I’m too old to do anything else. This alone is enough to distinguish such a martial art from whatever realities motivate people to start pub-fights, to ‘king hit’ random strangers, or generally stir up trouble wherever they go. But admittedly there is also a pleasure in knowing that if I or someone I care about is ever attacked I won’t make it easy for the attacker. It is good to know that I have developed the strength and the skill to give as good as I might get, while still knowing the limits of what any level of skill can guarantee. In applied linguistics we were taught that the best way to learn a language is to use it. How do you use a language? By making meaning. Meaning-making is pretty much the opposite of memorising vocab lists and taking part in feeble and uninspiring scripted dialogues. My ideal in learning Chinese has been to learn without making an effort to learn, to learn, as it were, by accident. But the key to learning by accident is to have a need or a reason to make meaning in your would-be second tongue. And while I have a number of reasons for wanting to be able to speak Chinese, I have little actual need for making meaning on a daily basis. Thus far my best efforts have involved an obsessive degree of online searching for information relating to the martial art I practise. I’ve learned quite a bit of incidental Chinese, can search online and perform fairly slow translations. But although there’s a surprising amount of transferable vocabulary from martial arts to everyday use, I have to face the fact that this interest is no longer enough to drive my learning. The next step in my eccentric plan has been to learn the lyrics to some memorable Chinese songs. The vocab and grammar are generally more transferable, and if a song is good enough it’s hard not to sing along. What better approach to efficient language learning! I’ve had this plan in mind for a number of years, but have been hamstrung by the limitations of popular Chinese music. Aesthetic appeal is somewhat subjective, so let’s just say that Chinese pop tends to be quite homogenous, and neither syrupy/nostalgic ballads nor rap are my style. However, I’ve recently discovered an excellent little tumblr site that chronicles a range of Chinese Indie music! The odds of finding something interesting, memorable, and worth learning have dramatically increased. First on the list is this track by 朴树/Pu Shu, titled 平凡之路/Ordinary Road. 那也曾是我的模样 That was how I once was. 故事 你真的 在听吗 Are you truly paying heed to the story? 直到看见平凡才是唯一的答案 Until I saw the only answer has always been an ordinary road. 她会好吗 还是更烂 Will it better or get worse? 向前走 就这么走 就算你被夺走什么 Go forward, as you are, no matter what has been taken away from you. 我曾经问遍整个世界 从来没得到答案 I once asked the whole world, but never received an answer. 风吹过的 路依然远 With the breeze blowing, there is a long way to go. 你的故事讲到了哪 Your story, how much has been told? The pacifist dilemma is that non-violence leaves us, as individuals and communities, subject to oppression. One of the favoured examples against non-violence is that Ghandi’s ahimsa only worked because the British were not truly bad people. Ahimsa would never have succeeded against a more brutal regime like that of Nazi Germany. From a spiritual perspective, ahimsa is not about what ‘works’; arguing that non-violence ‘works’ or ‘doesn’t work’ presumes non-violence is about ‘working’, which it is not. Pacifists are generally resolved to embrace the bitter consequences of their philosophy, harbouring no illusions that their path can be both moral and utilitarian. True pacifists deserve respect, but there is nonetheless a perfectly reasonable ethical distinction to be made between violence and self-defense. If my life and my health are good for me, then I have a right to enjoy these goods. Accordingly, no individual may have a countervailing right to harm these goods or take them away. Unjustified aggression is therefore ethically illegitimate, and the target of that aggression is right to defend against it, to protect their own life and the lives of others. – it must be proportional to the threat. A sense of threat is always somewhat subjective, but in ethics as in law, there is a ‘reasonable person test’ by which defensive actions will be judged. If someone shoves you at a party, it is not – all things being equal – proportional to hit him with a bar stool. – any injury caused must be an unintended side-effect of self-defense. In order to stop someone from hurting you or another innocent person, an appropriate use of defensive force may result in injuries to the aggressor. These injuries, though foreseeable, are considered ethically acceptable so long as one’s overriding intention is to defend, not to injure. In medical ethics this is known as the principle of double-effect, the recognition that good actions sometimes have foreseeable yet unintended negative effects. Some people see self-defense as an excuse for violent retaliation, an opportunity to injure others with moral impunity. This is not true self-defense. If we do not abide by the principles of self-defense, we cannot walk away from a violent confrontation with a clear conscience. At the same time there is something elegant about this view of self-defense: in merely defending the sphere of your own life and rights, it is the aggressor who bears moral responsibility for the harm and injuries that befall him as a result of his own violent intentions. Why learn a martial art? Melancholics have a hard time communicating the value of their interests and ideals. We’ve learned through experience that we are in a minority, that the things which motivate us do not tend to motivate others and vice versa. I was amazed to learn that ‘everyone is doing it’ is actually an implicit motivator for some people, designating the gold standard in life-choices. I’ve only ever interpreted such statements ironically; and though I follow the crowd in many instances, knowing that ‘everyone is doing it’ counts as a disincentive. But one of the themes of this blog is to begin communicating the value I find in my various, seemingly useless interests, pastimes, and ideals. In other words, can I explain to you why I do things that give me neither money nor social status nor an efficient path to commonly identifiable individual or social goods such as ‘getting fit’ and ‘making friends’? This time the topic is martial arts. Specifically: why have I spent more than half my life putting time and effort into something that is unlikely to ever prove ‘useful’? I started learning Taekwondo as a young teenager after my parents gave me a choice: either join the local TKD class or sign up with the local soccer team. Soccer is probably fun if you are somewhat fit, coordinated, and sociable. But since I was none of those things I chose TKD. The training did improve my fitness, strength, and flexibility, but it did so under the guise of learning a deeper skill – the ability to defend myself against other people. After a couple of years a friend introduced me to a very different martial art, a rare, difficult style of kungfu from Southern China that was taught informally within a closed group. It was immediately clear that this style of kungfu was deeper than anything I had learned in TKD. The training was much more complicated and intense, the tactics far more committed and aggressive, and the techniques significantly more powerful. I’ve been training in this art for more than sixteen years, and my motivation, understanding, and interest have changed a great deal in that time. Sometimes I wonder what I get out of it, why I am still motivated. Is it simply that having put so much in, it would be a waste to stop now? Or has it become so habitual that I no longer need a conscious motive? My recent post on violence and the masculine ideal helped bring out an answer, an enduring value in martial arts that is independent of any particular style or any degree of proficiency. That value is often described simply as ‘self-defense’, but is better described in a more nuanced way as the practised ability to ward off and resist violence. This is the lasting appeal of the martial arts: they train skills and techniques that in and of themselves increase our self-mastery. They develop latent physical and mental potential in the paradigmatic and pragmatic context of human violence. Paradoxically, evidence suggests that learning a martial art may make people less inclined to engage in violent behaviour. Anecdotally the logic is obvious: people who learn martial arts spend many hours training techniques and practising them in a controlled environment with willing participants. If you just wanted to get in fights, you’d be better off joining a football team or being obnoxious in popular night spots after 2am. For me, self-mastery is the core value behind martial arts practice, and provides an answer to the existential challenge of unjust human aggression. I do not want to find myself ever the victim of an attack that could have been avoided or defended with a reasonable degree of preparation on my part. Unlikely as such a scenario is, given the low risk lifestyle of a philosopher who’d rather be enjoying sleep at 3am than getting glassed in a drunken pub fight, I nonetheless have the pleasure and the challenge of training these same skills for their own sake. The development of these skills has indeed been one of the most challenging and rewarding things in my life. It has been a more consistent part of my life than any other interest, occupation, or training. It has been a source of inspiration, frustration, achievement and dismay, especially for someone whose passion for the art has always outstripped his aptitude. I can’t imagine life without it, and yet my efforts and dedication will always feel insufficient. It is humbling to think that what I get out of it is limited by what I have put in. There will always be more I could have put in, and I can only admit fault in being a less than ideal exemplar of the art. Perhaps that is why the value of this ideal is hard to communicate – I keep returning to the subject of my failure and inadequacy. But ask yourself whether you have something in your life that makes you want to persevere and work hard in full awareness of your faults? Is there anything that makes you feel inspired and humbled at the same time? Do you have something into which you can keep investing while knowing that the returns will never feel like ‘enough’? Without exaggerating the hopelessness of the situation, I think this is where philosophy and martial arts coincide. Whether you seek to master a skill or know the truth, you’ll find the horizon always stretching out before you, always out of reach. My teacher tells me he is always learning, and perhaps that is the key to such pursuits: to love the path, and find comfort in being someone who learns rather than someone who has just arrived. Rarely is it argued that since men are particularly vulnerable, they should not go out alone at night or drink above a certain limit. Since men are, potentially, both victim and perpetrator, it seems we’ve resolved to let them fight it out amongst themselves. As a parent of boys, I find this disturbing. While those raising girls might be faced with the awful yet relatively straightforward paradigm of vulnerable girl/evil world, for those of us with sons it’s more complex. If I attempt to protect my son from his own aggression and that of others, aren’t I pushing him towards “girl” status – the status of a victim? But if I toughen him up and prepare him to fight, am I not just creating another aggressor in a world where over 90 per cent of them are male? As long as masculinity remains powerful, it seems there will never be an in-between. As a powerfully masculine man myself, it appears the author has fallen into a false dichotomy. It is not the case that men must either be a victim or a perpetrator of violence, because we also have the option of self-defense. Self-defense is a perfectly legitimate and well established use of force with both legal and moral precedent. Furthermore, defense of self and others is traditionally regarded as an ennobling and virtuous application of masculine power. The author is right to worry that promoting non-violence will leave her sons vulnerable in a ‘dog-eat-dog’ world. But her false dichotomy of victim/perpetrator pushes her towards a gender-based critique of violence that pins individual security on the hope of an ideologically transformed society. Do you want your son to kick or be kicked? As long as we maintain our obsession with gender, the choice has to be between aggression or victimhood, masculinity and femininity stripped bare. Anyone familiar with the theory and practice of self-defense will know that there are alternatives to ‘kick or be kicked’ – alternatives that begin with making informed choices about one’s environment. People interested in self-defense will indeed point out the dangers of being overly intoxicated in the wrong venues at the wrong time. A cursory inspection of violence statistics will demonstrate the increased risk of assault that comes from being out drinking in the early hours of the morning. For people interested in self-defense, violence is genuinely an unwanted escalation, yet something we ought to be prepared for. I’ve met a number of men involved in martial arts over the years, and their unanimous opinion after years of ‘toughening up’ and learning how to hurt people, is that we should avoid it as far as possible: run away, apologise, humble ourselves, call for help, in order to avoid a fight. None of these people wish to become victims, and many of them are well prepared and capable of using force to defend themselves. But nor are they remotely inclined to become aggressors, using violence to victimise others. It is a concern when people promote a view of ‘violence’ that ignores the moral distinction between aggression and self-defense. A man can be tough without being callous, powerful without being violent. Perhaps there are ideological reasons for ignoring such options, but I for one will have no qualms in teaching my son the how’s and why’s of the legitimate use of force. And if I had a daughter I would teach her exactly the same thing. What would you do if money was not an issue? Taking money out of the equation is supposed to help us discover what we would really like to do with our lives. But it’s a rare individual who interprets this question in any manner of useful way. Me? I tend to interpret it as “what would you do if you had an infinite supply of money?” to which the answer is “a whole lot of extravagant, indulgent, expensive, money-driven pursuits and acquisitions.” If money were really not an issue, I would spend my time spending it. Perhaps a better question to ask is: What do you value in life apart from money? For a Melancholic idealist, this is indeed the better question to ask, sparing us the confusion of trying to imagine what we would be like if we were rich. It’s hard enough knowing what we’re like at present, let alone in unrealistic hypothetical worlds. It turns out there are a lot of things I value, appreciate, and enjoy a whole lot more than money. Spending money on a thing is, after all, a very practical indicator that I value it more than the money I spend. Basic necessities, a home, a car, clothing, a computer, an internet connection, and so on. Then there are the things I value that can’t easily be expressed in terms of money. I value philosophy. I value the long, difficult journey of learning a rare Chinese martial art. I value writing articles, the thrill of a new idea or a fresh insight, and the near-transcendent feeling of truly understanding something significant, complex, and deep. I value the accomplishment of finally mastering an intricate piece of Gregorian Chant, and the powerful resonance of chanting it together in a group. I value my thoughtful and reflective conversations with friends, as we each grapple with the pitfalls of our strangely disconnected way of life. I value recognising I am different from the norm, and having the freedom to continue being different and not succumbing to the stultifying rationalisations of other people’s lives. It is these varied and engaging adventures that enrich my life far more than actual money ever has. In that sense, if I had to choose between relative poverty with the freedom to pursue these riches, versus relative wealth at a cost of acceding to a narrower vision of life and meaning, then I hope the choice will always be as obvious as it seems right now. Having gone once already down the wrong path, I hope this painful lesson is well learned. Unfortunately our society is so compelling in its embrace of utility, it is hard to even think about things like studying philosophy or freelance writing without considering value in monetary terms or career prospects. We timidly embrace our ‘hobbies’ and ‘pastimes’ as though all the serious intellectual and moral content of our lives takes place in the confines of a conventional work environment. We are not used, despite ancient rhetoric, to seriously defending the claim that ‘an unexamined life is not worth living’, without instinctively grasping for some utilitarian apologetic to the effect that ‘philosophy graduates have highly translatable analytical and problem-solving skills’. If you find yourself, poor melancholic, in an uncomfortable state of career dishevelment, reflecting on the financial irrelevance of your deepest and most sincere pursuits, I urge you fret not. If a career path or ideal job has not yet emerged to satisfy you, then perhaps it is worth admitting that no ‘job’ ever will. You’ve most likely already found two or three key themes, pursuits or ideals that give genuine meaning to your life; in that sense you already have the answer. We’re often told that the luckiest people are those who love their job, or who get paid to do something about which they are truly passionate. But we are rarely told how lucky it is to be passionate about something meaningful and worthwhile in the first place. It’s so lucky, in fact, that we shouldn’t feel bad about working any kind of job to make ends meet. We shouldn’t feel as though we ought to love our ‘careers’ when we’ve already found something we love more than any salaried position. The answer by now ought to be clear: make time, give yourself the opportunity to do the things you love, the things that define you as a person and enrich your life. While this will mean having a career on the side, doing whatever work you have an affinity for, it will also mean that the work is never central, never overshadows the true meaning in your life.